Horrible.... waste of time. Bad acting and plot! Why did you make this movie JJ Abrams??? Who wrote this movie, some Netflix or Amazon Prime original writing hack? This movie deserved to go straight to dvd or Netflix. Casting, acting, storyline.....all sucked. Complete dogcrap. Can't believe Abrams is connected with this waste of my money. Special effects were excellent. You simply have to overlook some of the portions where the Nazis were attempting to bring the dead back to life for war if this is not your "thing". Simply a good movie. Wild movie with an interesting twist. Wish there were more good war movies. At best this is a three star movie. This is not a zombie flick nor a war movie or both; it's definitely not a horror film. Don't believe most of the 5 star reviews on this site as they were most likely written by paid reviewers. An exceptional war/horror flick that will keep you on the edge of your seat. It's a split genre plot that satisfies the war fan and likewise fills the bill for people who are into horror. I wrote a novel titled, 'Zombeast' which incorporates the same duel genre which takes place during the Vietnam war. If you like Overlord you will no doubt like Zombeast. Thank god we still had real men in those days or we'd be speaking German right about now. It's good some posters that are scared of these kinds of movies were born in this age of woosies... back then only real men saved us all...god bless the army and "real" men. I did not like torture. Nothing about it was a wwii movie except names and place. I would not recommend this movie at all. Lots of action ! Lots of stuff blowing up and great special effects , and zombies too! I saw it on IMAX and it was awesome ! Interesting plot and did have the WW2 feel to the sets and action you expect in good war movie. Unfortunately the CG effects get way out of control with pistol shots sounding like howitzers and minor explosions looking like the big bang. The overdone blood and guts just overwhelms the plot but the video game crowd may still enjoy this one. I'm into war movies and this one didn't disappoint, although I'm not a big fan of zombie-genre films. The acting was decent and the special effects were good. For those not familiar with Operation Overlord, this is an easy way to get introduced to the event. Now go read to find out the real story. 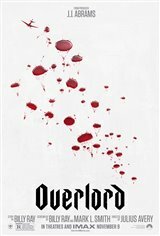 Overlord was exciting movie and we can see militarie life from begging to the end. Their mission on French village was big surprise when they discovered what Germans did in The Church. Overlord is a very entertaining movie. It is much more of a War film than a horror film and leans more into the sci-fi genre. The actors turn in a strong performance despite the film relying heavily on action scenes. It is somewhat like the game Wolfenstein. I would recommend the film but be warned it consists in large part oh explosions, gunshots and an assortment of loud sound effects. Exciting and entertaining movie! I love war movies and this was quite fun which reminds me of Call of Duty Zombies. This movie give a real glimps of the sensation militaries might have felt in the air on D-Day. Their mission on a French village is quite simple, but big surprises are waiting for them in the next few hours. I liked the Roles of Wyatt Russell and Mathilde Ollivier. This demonstrates the atrocities of the 3rd German Reich in the Second World War. On the edge of my seat the whole time. I enjoyed watching the movie and talked about it afterwards. Unique spin on a war movie. Enjoyed it thoroughly. Wished the ending could have been as fanominal as the beginning.